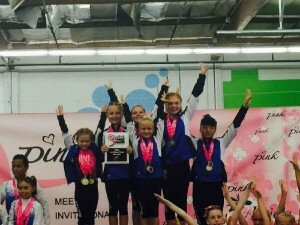 Central Coast Gymnastics is proud to have developed the largest Girls Artistic Gymnastics Junior Olympic program on the Central Coast. Our belief is that all athletes, regardless of their potential, must have a solid foundation of basic skills in order to advance safely. 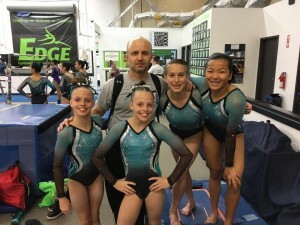 Our program allows the gymnast to advance at her own pace, working with a group of girls at her level or above, in a nurturing environment, with our enthusiastic, passionate, & highly experienced coaches, under our program director, Valentino Moutafov, has achieved the highest rating as a USA Gymnastics National Coach. the highest level of coaching you can achieve in the United States. Valentino is the first coach of this level of knowledge and experience to work at our facility in women’s artistic gymnastics. In order to compete in a USA Gymnastics sanctioned competition, an athlete must be a registered as a USA Gymnastics Athlete Member (level 3-10, elite) or Introductory Athlete Member (Levels 1-2 & Xcel). Our competitive girls team competition season begins in the Fall, typically September- November. 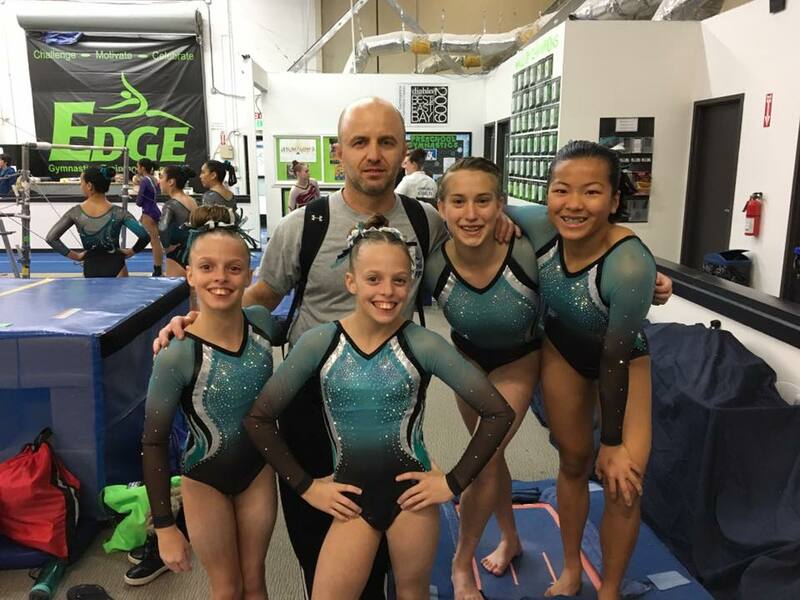 These gymnast may qualify to compete in the State meet per competitive year during the season pre-qualifying meets. Central Coast Gymnastics is proud to host the SLO Gym Fest girls USA Gymnastics Jr. Olympic level 2-5 compulsory competition. The Developmental Levels of Hot Tots, PreTeam-Level 1 & Preteam -Level 2 are simply designed at CCG to be a non-competitive and achievement-oriented program for use within a pre-team program, they may do introductory/recreational competitions, these athletes can perform their routines at our showcase events held at CCG, this gives them a great arena to learn to prefrom a in front of a captive audience. 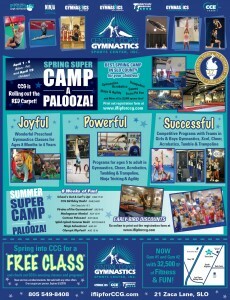 CCG does in-gym skill evaluating. 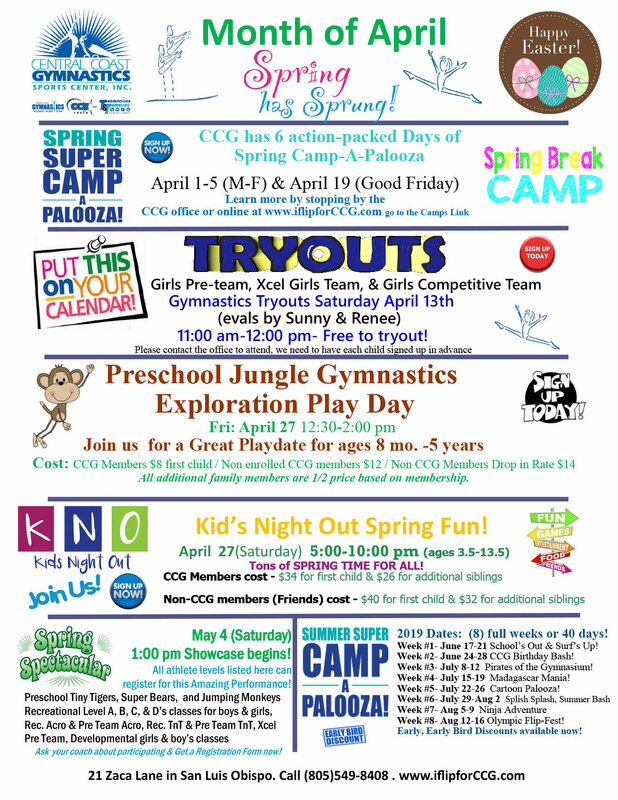 Gymnasts begin to enter at the Hot Tots level or Preteam Level 1, but may progress through the events and skills at different levels. Athletes may not skip any level (exception…Level 6 may be skipped, see below). They must advance one level at a time by scoring the minimum mobility score set by CCG and at a USA Gymnastics sanctioned competition (Exception: Levels 1-3 do not have a mobility score). The second part consists of Compulsory Levels 2, 3, 4 , & 5. these levels are progressive in nature, building upon the skills required at the previous level. 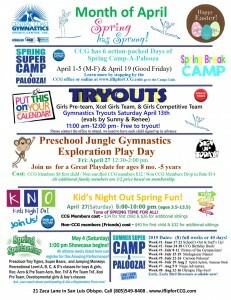 Competitive opportunities are provided up to and including the USA Gymnastics State Championships. 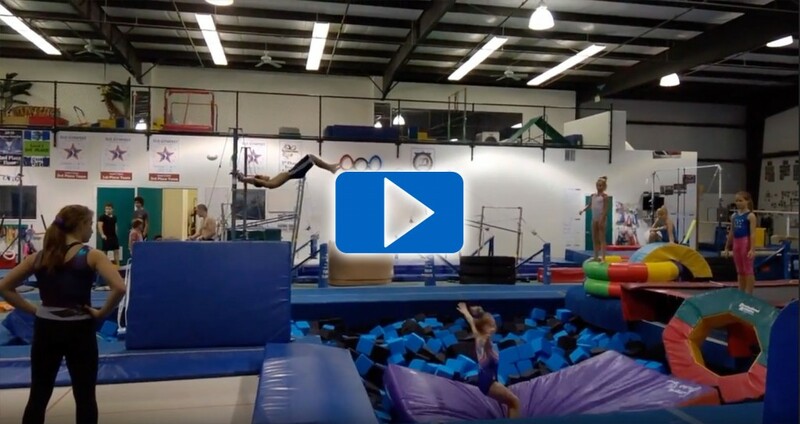 These are great way for an athlete to progressively move forward into competitive gymnastics. 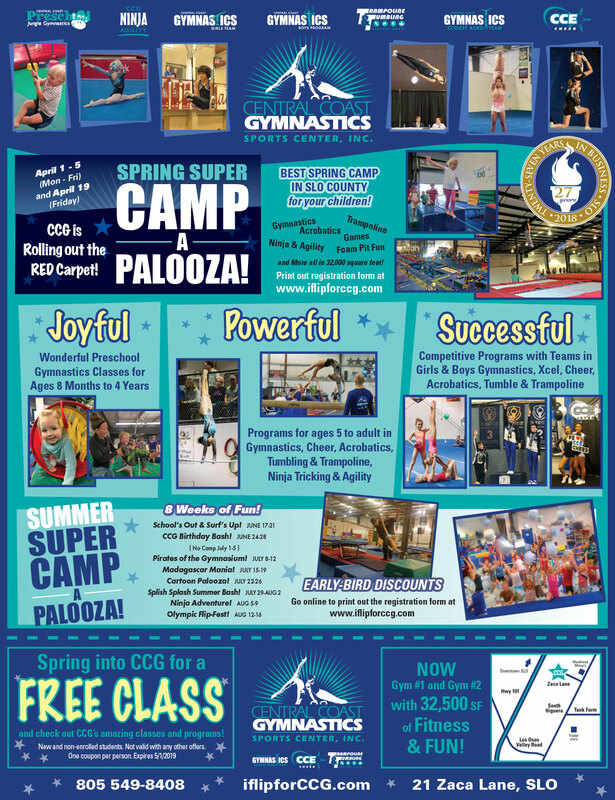 At CCG, our level 2 girls team is designed to ease the family from recreational gymnastics into competitive with little to no stress. 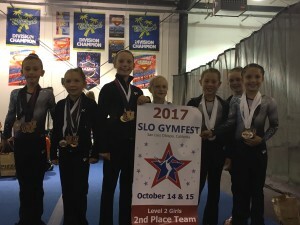 these girls first competition experience in the fall is at the CCG home competition, the SLO Gym Fest held in October, in their own gym. At CCG, our Girls Program Director, Valentino has these athletes split into training groups. These levels may vary between groups even more than shown below. It is the decision of the girls program staff and director. Group C is typically Level 4/5′s. 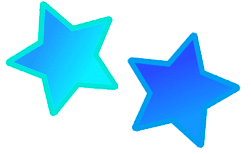 The third segment is the Optional Levels 6-10 & Elite. 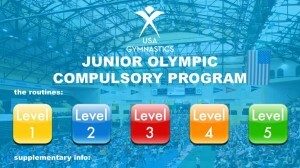 Levels 6, 7, 8, 9, & 10 gymnasts have progressed through the USA Gymnastics compulsory levels and are now ready for more creativity and difficulty, this is why these levels are called optional, they now have choices of music, floor choreography, routines designed to show off their strengths with required skills and movements. Level 6 has competitive opportunities up to and including State Championships. 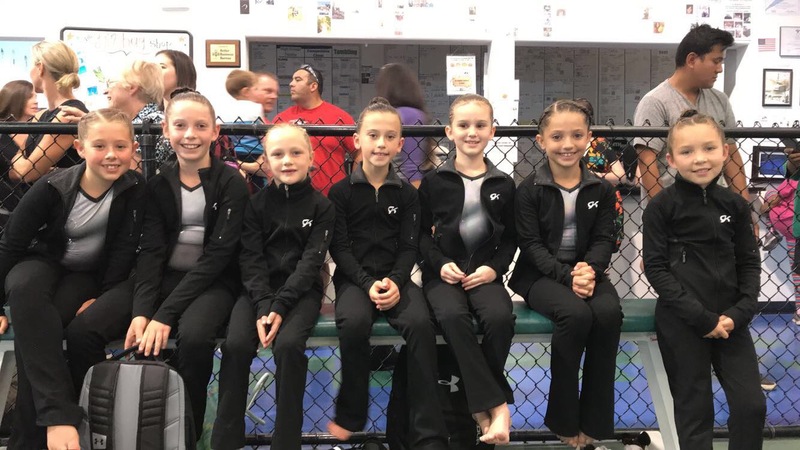 Additional competitive opportunities are provided for Levels 8-10, with the Level 10 competitive season culminating at the Jr. Olympic National Championships, Level 9 at the Eastern or Western Championships and Level 7 & 8 at the Regional Championships. Group D is typically Level 6-10′s. This group may also be split for training purposes. The coaches at CCG is amazing. 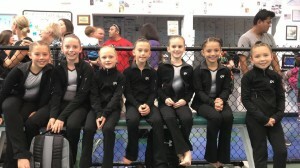 Our girls have been involved in the cheer and gymnastics programs for over 8 years now. The coaching staff is well qualified. They go above and beyond to ensure that our children are safe. They encourage the kids to do their best.